When it comes to menacing humans, certain cows hog all the attention. One in Rajasthan, India, made tabloid headlines in February for attacking a British tourist who had begun singing the Black-Eyed Peas song "My Humps" at it; the cow understandably took this as a provocation and charged. A few years earlier, the U.K. press had gotten on a story about an English farmer who'd tried to raise cattle from a stock originally bred in the 1920s and '30s by Germans hoping to recreate the aurochs, an extinct bovine master race once prevalent in the Fatherland. The present-day herd proved to be so aggressive that the farmer had to send at least half of them off to slaughter: "They would try to kill anyone," he told The Guardian. With such splashy examples in the mix, you'd be forgiven for overlooking the routine menace of the workaday cow, at least until one chases you off an Ohio farm. In the United States, though, you're more likely to be killed by cows than you are by alligators, spiders, sharks, and venomous snakes combined, according to a 2015 analysis of Centers for Disease Control data by the Washington Post. Granted, these are still exceedingly small numbers we're talking about. When I say it's 20 times more likely you'll be killed by a cow than by a gator, that's only because the country averages roughly one death by gator per annum, and 20 DBCs. As you'd guess, farms, ranches and feedlots are the main venues for cow-on-human violence. In 2016, the Bureau of Labor Statistics tallied 19 workplace deaths primarily caused by bovines, half the total attributed to nonhuman mammals in all. These numbers are fairly typical, meaning it's a notably unlucky civilian who goes out this way. How, specifically, does one come to grief via cow? Blunt injury, mainly, reports a 2013 article from the journal Trauma. "Cattle can weigh more than a car," the authors remind us, and so when a cow gets a good piece of you, the results tend to be "high-energy injuries with severe crushing tissue damage." 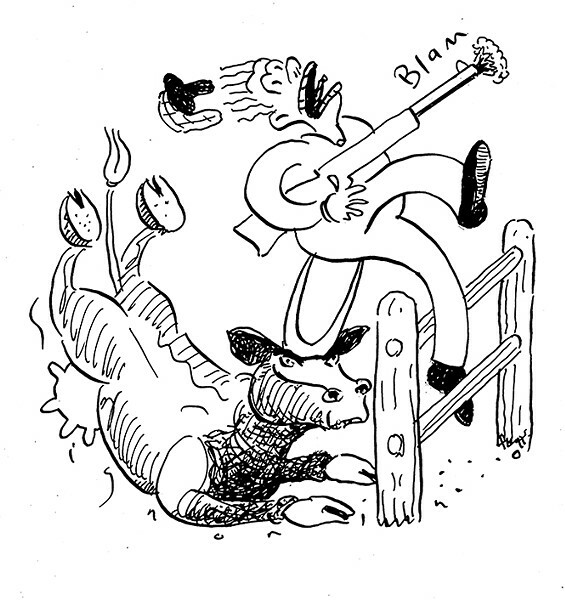 Overall, they found, kicking is the most common form of impact, though in a cited 2001 study of U.S. cow-related occupational deaths, the leading mechanisms of fatal injury were, in order, 1. charging, 2. trampling or stomping, and 3. pinning victim against (e.g.) a gate or wall, with kicking in fourth place. If the cow has horns, that's a whole other story: penetrating injuries "most commonly affect the abdomen followed by the perineum," another way of saying that if they miss you in the stomach they'll get you in the crotch. The complex mechanics of goring—wherein the victim often gets hoisted up on the horn, then wrenched around—means doctors see a lot of internal damage "even with seemingly small wounds." To paw this ground a little further, I'll refer you to the CDC's Morbidity and Mortality Weekly Report, which in 2009 included a study called "Fatalities Caused by Cattle—Four States, 2003-2008." This one isn't straight statistics but presents some grim case summaries as well. We read about a 65-year-old woman who "was removing a dead, newborn calf from a pasture when a cow knocked her down, stomped her, and butted her while she was lying on the ground"; a 65-year-old man loading beef cattle onto a truck who was subsequently crushed against the barn door; and a 63-year-old man who was butted, pinned against a fence, and stomped in his dairy barn by a bull with a rep for being threatening. The CDC editors note a few themes here. One is that cows can be prone to aggression when their young are present. Another is that cattle victims tend to be getting on in years: of the 21 cases examined, 14 involved people above the age of 60, and the report pointed to other data on higher injury rates for livestock farmers who used hearing aids or experienced arthritis or rheumatism. A presumably still-spry hunter out on the open field, not trying to get too near a calf? You might've been fine anyway, Crafter. Still, it's always best to take precautions: head for the fence pronto, and for god's sake don't start singing till you're on the other side.